More often than not, shelters and adoption centers have sparse, if any, information as to the prior owner(s) of the dog. Additionally, the centers and shelters typically have no background information as to the prior care, training or abuse of the dog by the former owner. This lack of information puts the new owner in a precarious position as the law in Georgia mandates that owners (even new ones) of dogs must be responsible owners; the breach (or failure) of which would make that owner subject to civil and possibly criminal liability/penalty. 1) Does an adopted dog have the ability to bite a person without provocation? 2) Is an adopted dog an unpredictable animal? 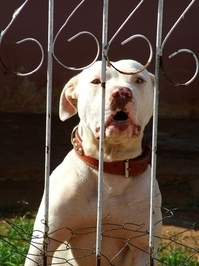 3) Does an adopted dog need to be leashed while outside the owner’s house? 4) Does an adopted dog need to be restrained while off the property of the owner? 4) Does an adopted dog need to be leashed when taken outside the owner’s home? 5) Does an owner of an adopted dog need to maintain control over the dog inside and outside the home? 6) Should every dog owner familiarize themselves with local ordinances regarding dog ownership and control? In real life situations, when the owner does not follow these practices and as a result, a person is injured, then that owner may be subject to a dog hearing in front of a judge in the local county for determination as to whether that owner violated a local city/county ordinance regarding animal control. A finding or pleading of guilty as to any ordinance will result in monetary fines. If you are ever selected to sit on a jury as to the determination of monetary damages that result from a dog owner’s violation of an ordinance or state code that led to the injury or death of a child or adult, then please do not swayed by any argument from the defense that owners are not responsible for the actions of adopted dogs. The law applies to all dog owners irrespective of the origin of the dog. If you or a member of your family has been bitten by a dog, then please contact an experienced dog bite lawyer. The Law Offices of Kevin C. Ford currently accepted dog bite and animal bite cases throughout the State of Georgia. Please contact us today for a free consult regarding your legal rights and discussion of your particular set of facts.